5th January, 2002: You will no longer be able to access bahamasuncensored.com from this site without typing directly into the “go to” or “address” section of your computer. The site has now been de linked from the successor site. Bahamasuncensored.com continues to have a fresh update at 2 p.m. each Sunday. You can still click here for the archives of fredmitchelluncensored.com. Thank you and we hope you enjoy bahamasuncensored.com written by Russell Dames with Claire Booth. 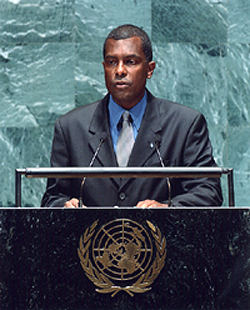 Minister of Foreign Affairs Fred Mitchell is pictured addressing the United Nations in New York.